January 1984. In the 12 months since the last post, the Cold War deteriorates as the USA runs a series of military exercises to test the responsiveness of the USSR. Apocalypse comes a step closer. In the UK, despite over three million people being unemployed, the Conservatives win the June 1983 election with an increased majority. And on August 19th, during rehearsals for this story, the BBC announced that Colin Baker had been cast as the sixth Doctor. Which means that for the 20th anniversary special and the whole of his final series (which aired between January and March 1984) the fifth Doctor was publicly a dead man walking. Colin Baker’s new Doctor – complete with patchwork costume – was unveiled to the press on 10th January 1984, while the new season was only a week in, and with another 17 Davison episodes to go before his replacement actually turned up in the show. In the 21st Century that’s been how the programme has been made – we knew Eccleston was going from week one, and Matt Smith was announced a whole year before he arrived. But back in 1984 this was an unprecedented advance notice of a new Doctor. Given that The Five Doctors ends with the fifth Doctor receiving the approval of his predecessors and setting off for new adventures, it’s poignant that kids old enough to read the Radio Times 20th Anniversary special (like me) already knew his days were numbered. The final three Davison stories are very much a winding down of the era, with Tegan and Turlough written out before the fifth Doctor made his last bow a fortnight later. Season 21 therefore has a similar funereal feel to Season 18, where everything starts to lead, inevitably, to Logopolis. And if a chunk of Season 18 was about adjusting the show to continue in Tom Baker’s absence, making the indestructible fourth Doctor suddenly old and vulnerable, so Season 21 prepares us for the imminent Colin Baker years by thoroughly trashing the fifth Doctor. I think the production team’s plan was for the sixth Doctor to be a more active, interventionist Doctor – in control of events rather than buffeted by them. If the fifth Doctor’s fatal flaw is trying to reason with a cruel and unreasonable universe, and in the process becoming “neurotic” and “effete”, then, on paper at least, the sixth Doctor is Eric Saward’s solution – a bullish anti-hero who gets the job done without worrying about the niceties. 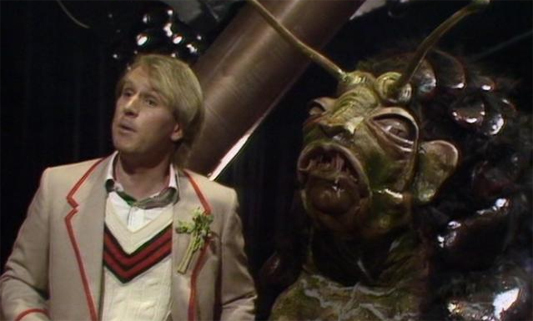 In Season 21 the fifth Doctor dithers over the Human-Silurian War and killing Davros, and ends up opting out of doing anything on Androzani bar trying to escape. On three occasions, this hero Doctor ends up in the middle of bloodbaths. That’s quite a compelling argument why he has to go – to be replaced by someone who’s actually capable of achieving victory. Sadly, it does mean that a good chunk of Season 21 consists of grim, gore-drenched massacres complete with poison gas and melting heads. That one of these is also the best-ever Doctor Who story is – like the fifth Doctor himself – a lucky accident. The last time Doctor Who was quite so grim, and the Doctor quite so ineffectual, was in Season Three, and that ended up with Steven walking out on him in disgust, just as Tegan does in Resurrection of the Daleks. Then you have the other half of Season 21 – the bits that I love. The Awakening and Planet of Fire are both magnificent and under-rated. And then there’s Frontios, which is one of the best Doctor Who stories ever. It’s so good, it’s been indirectly referenced by both Russell T Davies and Steven Moffat, and gives one of its lines to the title of The Hungry Earth. The first episode of Frontios is an inspiration for Utopia. The TARDIS has drifted too far into the future, past the destruction of the Earth and into the orbit of one of the last outposts of humankind. Not even the Time Lords came this far. In the middle of a meteorite shower, the Ship is forced down onto the desolate planet, which the Doctor, Tegan and Turlough quickly learn is on the edge of destruction, its population wiped out by the attacks from the skies; cannibalistic retrogrades circling like wolves, or else consumed by the hungry Earth. By the end of Part One, the TARDIS has been ripped apart by an unfathomable force, its crew trapped at the end of the universe. The situation is as grim as anything this season. Fortunately, the Doctor is more chipper than he’s been for quite some time: his holiday in Little Hodcombe must have done him the world of good. From the moment he arrives on Frontios, he’s taking charge, saving lives, trying to help. Far from effete, he’s practically reckless: pointing out the flaws in their arguments and needling colony leaders Plantagenet and Brazen to the point where he’s a second from getting shot. He’s even joking about his companions, mentioning, “Turlough wouldn’t risk an unsafe tunnel” (I’m not so sure), and doing the whole brilliant routine about the Tegan android while Janet Fielding glowers. The moment when he politely reaches out to shake the Gravis’s flipper is a touch of Pertwee, and his joyously anarchic trumping of the Gravis out-Troughtons Troughton. But then, look at his reaction to the Gravis’s dismissal of Captain Revere’s death, a shadow of disgust and anger falls across his face. If this is the fifth Doctor Christopher Hamilton Bidmead had in mind when he wrote Castrovalva, what a shame he didn’t stay on as script editor for another year. Davison is astonishingly good. He never gives a bad performance, but I think this is pretty much as good as anyone has ever been as the Doctor. Bidmead also makes a virtue of the earnest cod-Shakesperean house style of the Saward show by having the dynastic leader Plantagenet speak almost entirely in speeches. This is clearly a joke, since as Plantagenet launches into one of his well-rehearsed routines Mr Range visibly rolls his eyes, having heard it all before. Everyone else is a little more naturalistic. Mark Strickson enjoys getting to do something other than cringe in corridors: to an extent, this is a story about Turlough conquering his fears – stepping in to save the Doctor with a “deadly” hat stand, then, battling repressed memories of the Tractators, forcing himself to go back into the tunnels to rescue the Doctor again. There are also a lot of things that don’t quite work. The info text on the DVD takes great delight in pointing out some continuity errors. The excavation machines aren’t as shocking as Bidmead intended (quite rightly). And equally, the Tractators are a good idea in principle that don’t quite work in practice. But that’s the 34-year-old me writing. The five-year-old me remembers the cliffhanger to Part Two vividly as the Tractators doing a kind of Red Indian dance around the captive Doctor and Tegan, and took to wearing a washing basket on his back to imitate them. But then, five-year-old me also thought the Myrka was a terrifying dinosaur that came smashing through doors to give him nightmares, so he’s clearly an idiot who can safely be ignored. The thing is, though, there are lots of Doctor Who stories where things don’t quite work, but which we forgive. Because it’s not a conspicuously important story – no-one leaves, no significant new characters or monsters come back or get introduced, even the Doctor’s new orange trousers debuted in the previous story – Frontios tends to be forgotten. And that’s sad, because Bidmead’s script – with its use of the TARDIS as a complicated space/time event and not just a magic box; the belief that enlightenment comes only through scientific progress, and an emphasis on engaging with and understanding the world around us – is every bit as interesting as Logopolis and Castrovalva. But this time Bidmead’s managed to make it work in the shape of a traditional Doctor Who story with monsters. Until the Doctor helps them to understand the true nature of their enemies, the last humans assume the attacks are coming from above, not below. After Captain Revere’s death, the leaders have even sealed up the research room, symbolically turning their backs on learning and science and placing all their hopes in the hereditary heir of the colony, or, in the Rets’ case, in the miracle of Cockerill’s escape. But unquestioning obedience to your leaders, turning away from scientific investigation and concealing the truth are shown to be the paths to retrogression and ultimately extinction. Never has the fifth Doctor looked more like a light in the dark, a shining beacon of beige in a sea of grey and black. Once he’s understood the nature of Frontios and the Tractators, the Doctor doesn’t need a gun to win. He doesn’t need to gas the Tractators to death, or threaten to shoot their leader in the face. He reasons his way to a solution. He lures the Gravis into the remains of the TARDIS, and tricks it into using its power to reassemble the Ship. The Doctor uses the TARDIS itself to defeat the Gravis, just as he later will, in Blink, to defeat the Weeping Angels (he even mentions “the gravity of the situation”, a line Moffat lifts for Flesh and Stone). Humankind is saved, and even the monsters get to live. In the next story, the Doctor’s back to carrying a gun. Victory over the Daleks will come at a terrible cost, as will almost every victory during the course of the next couple of years. So this is how I want to remember the fifth Doctor: the Doctor who redeemed Turlough, who saved the human race, and let the monsters survive. Never cruel, never cowardly. A hero. The fifth Doctor. You were my Doctor. Next Time: “On my oath, you wouldn’t want that served wiv yer onions. Never seen anything like it in all my puff. Oh, make an ‘orse sick, that would!” The Two Doctors.